"A killer stalked the shadows." That first line is very telling about this solid story, which unfolds in Jon Sprunk's debut, Shadow's Son. The city of Othir is the center for nefarious political and not so political dealings. Caim has made a name for himself in Othir as the go-to man for assassination. He is given a job that looks to be a simple sneak and stab turns into anything, but as Caim is thrust into the middle of a deep plot to change the political structure of the region. Josey a rich, spoiled heiress is dragged into these dealings far too quickly for someone of her pampered upbringing. Caim is often accompanied by Kit a rambunctious and quick-witted entity with no physical presence who can only be seen and heard by Caim. Think of Kit as Caim's as to Harry Dresden's Bob the Skull only a much more loose lipped, freewheeling fairy godmother who is scantily clad. Kit is the jealous type and is quick to runaway whenever the mood strikes. Wonderful fight sequences is what you expect out of a Swords & Sorcery novel and Sprunk more than delivers on that front as Caim swirls out of the darkness and into the hearts of his enemies. In many ways Shadow's Son isn't a very new plot as we have damsels in distress, cold-blooded assassins, and a political situation ripe for the toppling. 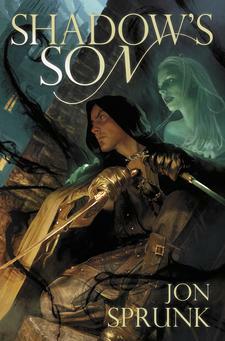 Yet Shadow's Son revels in the tropes of Swords and Sorcery keeping it an engrossing, page turner. If you are a reader just after a fun story Shadow's Son is a pleasure. Caim is certainly a likable, albeit closed off, character who rolls with the punches. Caim has unusual powers involving pulling shadows around him. There appears to be more to them, but their extent is still unknown as Caim has pushed himself away from them most of his life. Josey was at first playing the damsel role to the utmost and falling a bit flat what with her prissy and sheltered nature, but I was surprised in the last third how quickly I grew to care for her. Sprunk does have a habit of being too quick to kill off some characters as he probably could have gotten a bit more out of them, buts he gets to the heart of the matter quickly and effectively. Where Shadow's Son excels is in the area of baddies. Ral is Caim's nemesis of sorts. Both are assassins. Only while Caim does it because he is good and it is a living, Ral revels in his deeds to fuel the lifestyle he was born into and frittered away, who seems to love to spread his sense of entitlement around. Caim's other foe Leviticus is quite impressive as he bleeds through the world with strange and impressive powers. I could have definitely used a few more fight scenes with Leviticus, but Sprunk is clearly holding that for later in the series. Shadow's Son had me up late at night as nearly every chapter ended in climax after climax of tight action sequences to see how Caim will get out of the next scrape. Fans of Brent Weeks and Brandon Sanderson will certainly find plenty to like here, but in a much smaller package as it is less than 300 pages. I give Shadow's Son 7.5 out of 10 hats. Even though this is the first in a trilogy Sprunk does an admirable job at having a clear culmination to most of what he started while leaving plenty left open for the next volumes as things escalate. Sprunk shows loads of promise as he hones his craft. The sequel in this trilogy, Shadow's Lure, will most likely be out sometime next summer, which will delve further into Caim's origins and mysterious powers. Hopefully we'll get more Kit as well because she was missed by me during most of the middle. Thanks for this wonderful review. I have this book on my want list here. I am hoping to get it at some point here. Thank you again. I like when books keep you up to keep going. Sounds like a read I could enjoy.